An injury-time goal saw Morecambe denied a point in the cruellest of fashions. With the clocking ticking towards the end of four added minutes, Malvin Benning scuffed an effort at the Shrimps’ goal which may - or may not, depending on whose version of events you believed - have been deflected in by Mansfield substitute James Spencer. It capped a second-half receovery from the promotion hopefuls after Danny Rose had cancelled out Callum Lang’s first-half opener for Morecambe. Morecambe manager Jim Bentley had made two changes from the side which drew at Newport County in midweek with Vadaine Oliver and Lang replacing Adam Campbell and Adam McGurk. A third change followed inside 10 minutes with Steve Old limping off, necessitating the introduction of Andy Fleming in midfield with Alex Kenyon dropping into the back three. By that time, Kenyon had already had Morecambe’s first effort with a shot blocked by the visitors’ defence. That was as near as either side managed in the opening moments with the combination of a rutted pitch and a strong early breeze making the game more of a battle. Oliver and Zander Diamond also had efforts blocked before Morecambe should have taken the lead on 28 minutes. Luke Conlan’s shot was deflected behind and, from the resulting corner, the unmarked Kenyon headed over. It was Morecambe who took a 31st minute lead when, with Mansfield unhappy an offside decision hadn’t gone their way, Lang capitalised on Krystian Pearce’s sloppy back pass to round keeper Conrad Logan and score. Oliver headed over with half-time approaching, after which the visitors made two changes, introducing Paul Anderson and Will Atkinson in a bid to get back in the game. They certainly had much the better of the second half with Morecambe struggling to repeat their high intensity performance in the opening 45 minutes. Alex MacDonald twice had long-range efforts at goal and Barry Roche held Rose’s header before the scores were levelled on 70 minutes. With Morecambe protesting that Oliver had been fouled, the visitors broke and CJ Hamilton played a nice one-two with Atkinson before squaring for Rose to find the net. Rose shot wide from 20 yards before Roche was called into action to keep out efforts from Kane Hemmings and Atkinson. It was Mansfield who had the best chance to win it late on as Hamilton somehow headed over from inside the six-yard box. 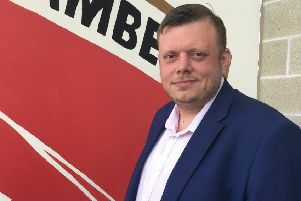 Too often, Morecambe’s attacks broke down once they got to the Mansfield area with Fleming seeing a shot blocked as four minutes of injury time ended with honours even. Then, just as honours seemed set to be even, Mansfield broke and the ball found its way to Benning, whose effort ultimately bobbled and bounced its way past Roche. Morecambe: Roche, Muller, Lavelle, Old (Fleming 10), McGowan, Kenyon (Thompson 83), Rose, Conlan, Lang (Wildig 72), Oliver, Ellison. Subs not used: Nizic, Campbell, Lund, McGurk. Mansfield Town: Logan, Bennett, Diamond (Anderson 46) , Pearce, Benning, Potter (Atkinson 46), Byrom, MacDonald, Hamilton, Rose, Hemmings (Spencer 79). Subs not used: Olejnik, Digby, Angol, Butcher.